"...It is said that in water there lives yet the magic of the Music and its tales - The most wonderful songs in the world are sung by water in rivers and waterfalls. " The story, based on ancient hobbit fairy-tales concerns two hobbit children, Benno and Waterlilly, who live in a house by the waterfall in Little Delving with their father, Baldo, who remains distraught over the loss of his wife in a boating accident several years earlier. Though Benno is aware of the responsibility that comes with being a big brother, he is easily frustrated with Waterlilly, who, at four years old, has yet to speak a single word. When Waterlilly discovers a small flute made out from a shell that used to belong to their mother, the spellbinding music she creates becomes both a means of communication and the key to a magical secret locked deep in their mother's past. THE SONGS OF THE WATER, a Hobbit Heart musical homage to Shire Rose and Spring will take place in the lovely village of LITTLE DELVING, the Shire. 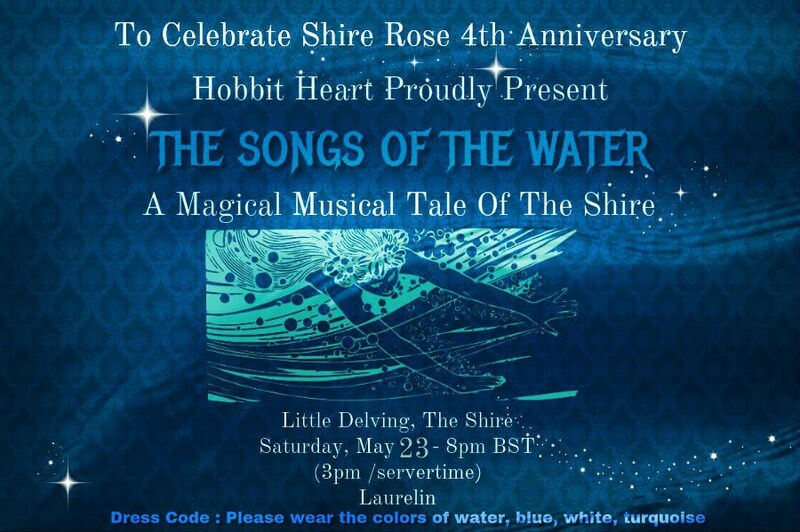 SONGS AND POEMS OF THE WATER will be a May Hobbit Heart Performance of twirling and enchantment, produced by Shire Rose. Music , poems and stories, are carefully collected from collections of songs and poetry of the Greenfields ((Irish/Celtic/Classic)).